Once powered on with a 5V & 12V DC supply after converting from AC volatages we were presented with a black display on the monitor, after checking the clock signals around the board there looked like there was plenty of activity across the board. I did a quick visual inspection and noticed that the 74165 at H4 had been inserted backwards in a socket. This was replaced ans inserted the correct way round. Whilst probing around the board we found some bad outputs from a 7414 (Hex Inverter) at J9. This IC deals with input directly from the control sticks. I can't remember the exact issues but I'm guessing the inverting of signals wasn't correct on a few of the outputs. Next I looked at the locations where the video signals were mixed together. A 7427 at C5 mixes the H Blank & V Blank signals along with 'PWR Reset' signal, this signal was low, it turns out this issue was an effect of making the DC conversion. The Power reset is triggered from a transistor which is on the AC side of the board and as we removed AC it was never triggering, well it triggered once when the board was powered up. I ended up tieing this signal to a 12MHz signal from the board (No notable side effects yet :) ), this falsly switched the reset signal and the video display now appeared. Well some of it did. We had a gray background and the scores showing but no Jets. Part of the power reset circuit that we were now bypassing contained a 7474 at R3. This was confirmed as being faulty and replaced. Technically it is now being bypassed. With the reset now taken it was time to find out why the Jets were missing. This fault took me a few hours to track down.. The long & short of it turned out to be a faulty 7413 at D9. This is part of the circuit that detects when either of the player start buttons are pressed. 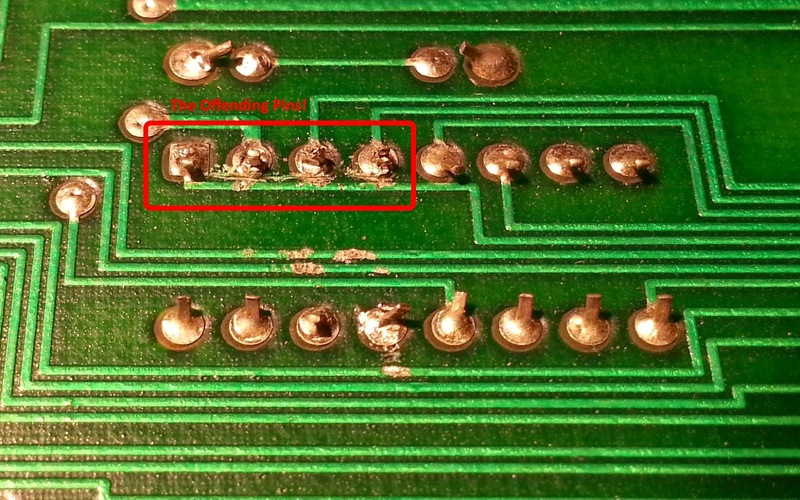 Pin 8, the output section for the 2 player start button was stuck high, this placed a 74175 flip-flop further down the circuit in the wrong state. 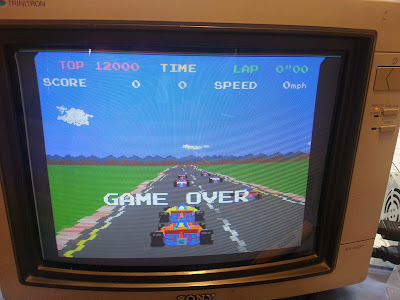 The 'START' signal for the game usually pulses and resets the game scores along with the Horizontal & Vertical position counters for the Jets, with it being stuck permanently on the location counters for the Jets were constantly being reset, happening so often that the video never showed on the display. When removed from circuit and checked in my IC tester it was confirmed as faulty. 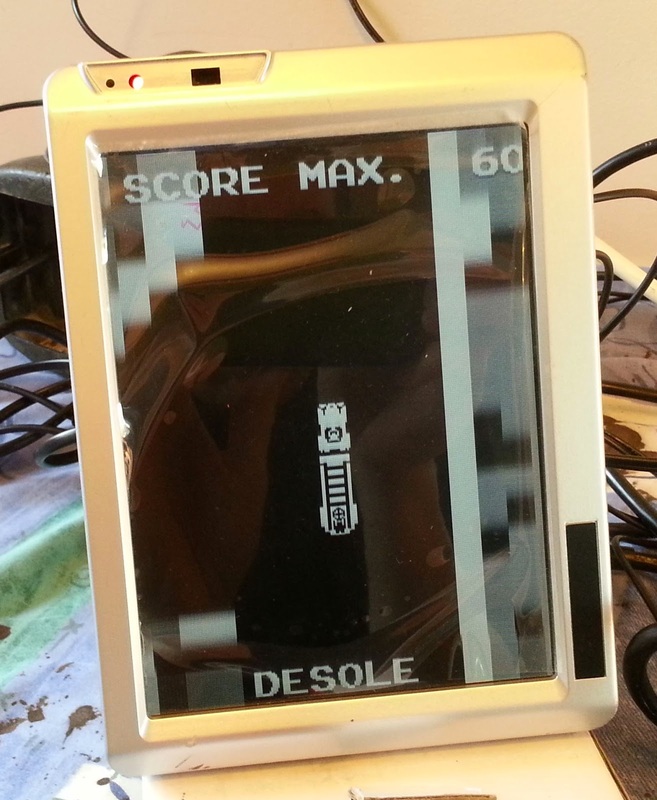 Once socketed and replaced we have Jets on the screen during Attract mode. Finally we could now see both Jets flying but one of them (Jet 2 - White) had constant inverted video. Pin 6 of the 7432 at K8 was stuck low, forcing the game to think that Jet 2 was constantly being blown up. This is usually a 1 second pulse which should occur when a plane is hit from a missile. Socketing and Replacing the IC fixed this problem. I hooked up the sound outputs to a speaker and we're certain getting game sounds. So we now have a game that looks to be working with audio & Video. Vic will fully test it when he puts in in his cab, I wouldn't be surprised if we has some small issues to deal with like Jet rotation or score counting problems which I've previously dealt with. Short video below showing the board running in it's semi-complete state. Strange find in my new Enduro Racer cab... So the marquee doesn't light up, lets take the monitor surround off and see what's going on,..This is not quite what I expected to see.. So I moved my games around today making space for a new cab and upon turning Jet Fighter back on the score for the white Jet was missing form the display. /Score1 is the Video signal for the black Jet score and it was pulsing away on my logic probe. /Score2 was for the white Jet and that output (Pin 3 of C3) was stuck high. I checked the input signals and they all looked good so I piggybacked C3 with a new 74LS00 and the score came back. 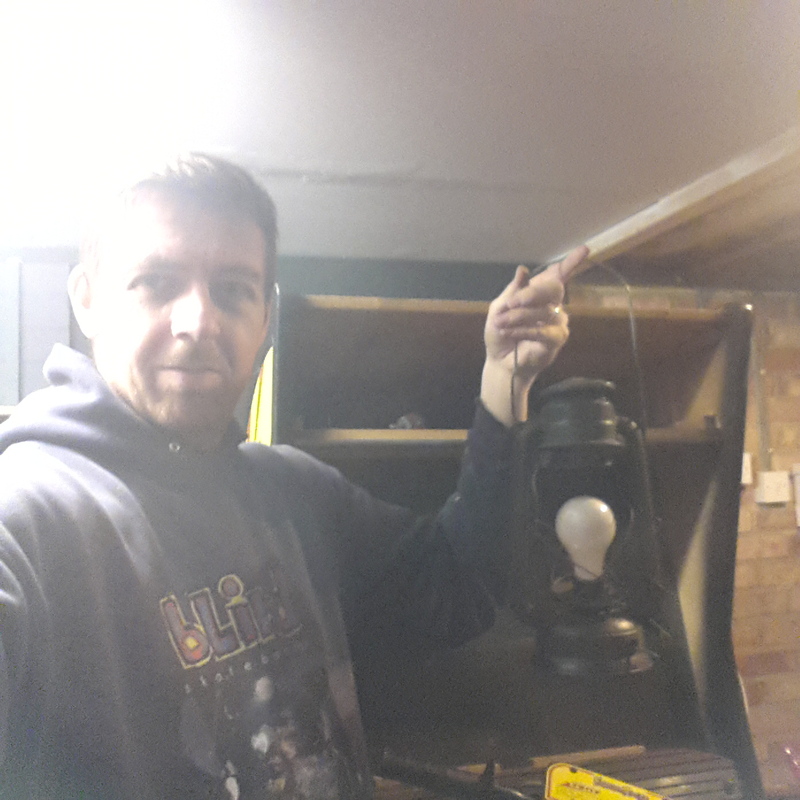 I removed the bad chip, fitted a socket and popped the new 74LS00 in and everything is working again. 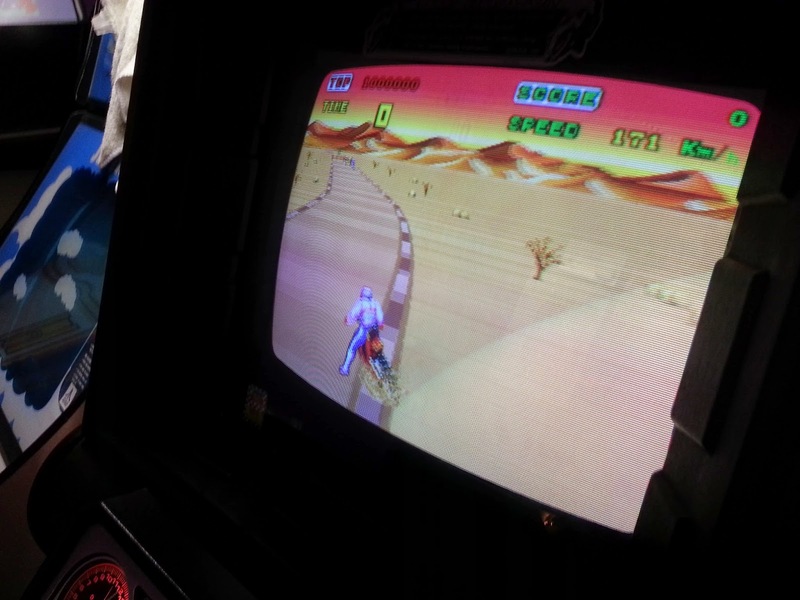 Sega Outrun in a Power Drift arcade cab. 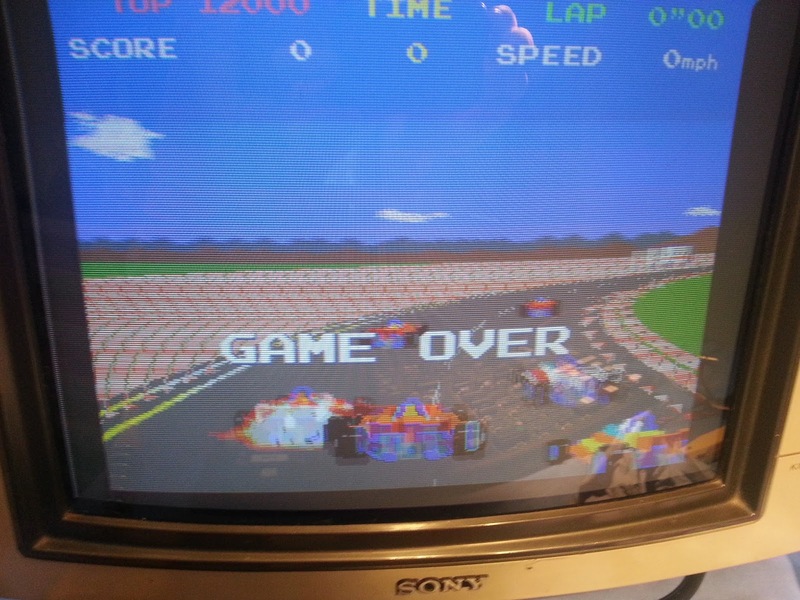 My newest arcade cab I picked up was a Sega Power Drift, unfortunately both the CPU & Video boards had faults with the Custom IC's, this basically rules them out of being repaired unless swapping the parts with IC's from another Sega board set which very rarely come up for sale... 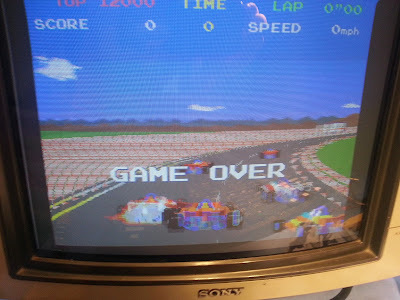 So what to do with a really nice cab, put a cracking game in it that by my reckoning used the same cabinet hardware but different connector arrangement, yes its Sega's finest racer Outrun! 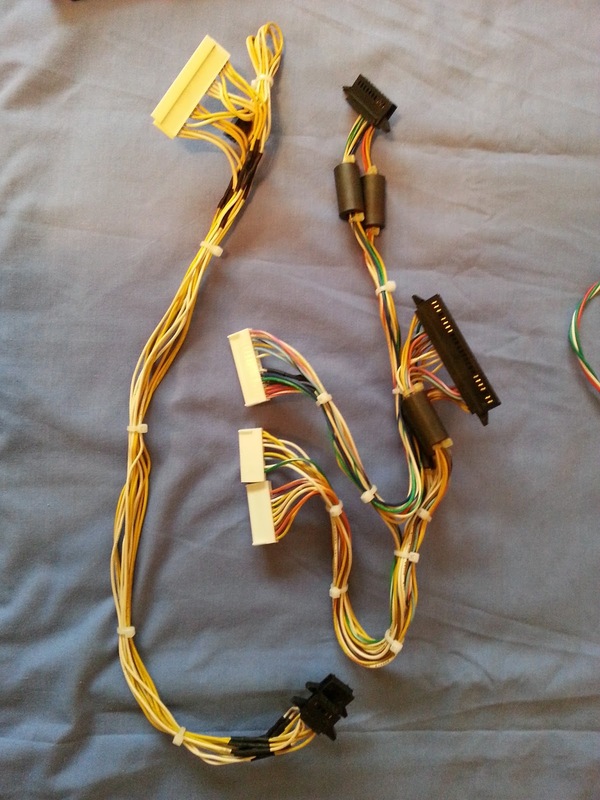 I started off by comparing the wiring pin outs in the back of the user manuals, once these were documented I set about transposing the pins from the Outrun board onto the Power Drift connectors. 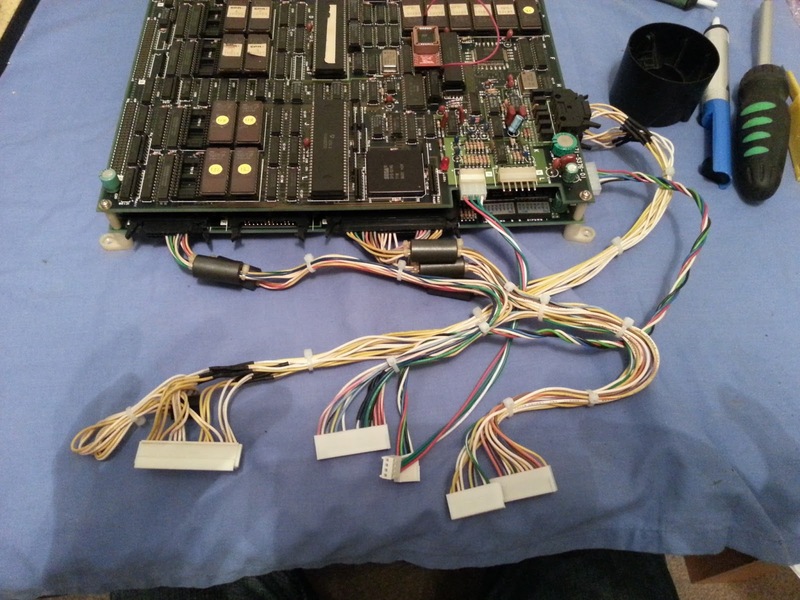 The Power Drift cab has a filter board that connects all of the cab wiring together, there are then another set of cables that connect to the PCB. This would mean that I just need to make a new set of cables from one side of the filter board to the Outrun PCB. 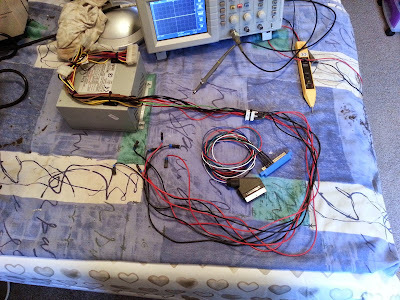 Luckily for me I had an Outrun loom that I could use therefore meaning I only needed to marry up the wires to the Power Drift filter board using new connectors. The connectors labelled 'AMP' on the Sega boards seem difficult to source, a company called JST seems to produce a very similar connector but I had trouble sourcing these, that's why I decided to use my Outrun loom.. I have ordered some IDC connectors which are a similar connector type as used in PC's for the IDE & SCSI cables. Once these arrive I will make another loom and provide info on what needs to be used as I'm guessing this will be the route anyone else thinking of doing this will go down. 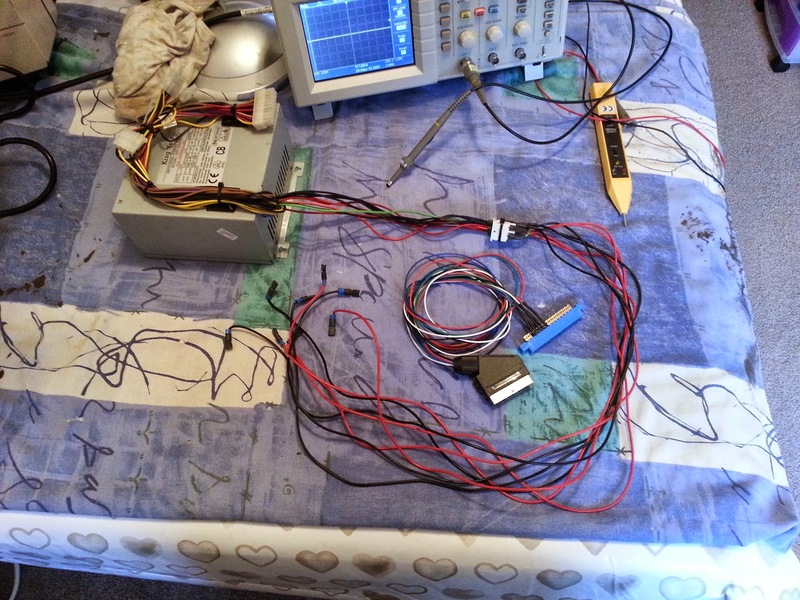 Every cable with exception of Coin Switch 2 and Coin Meter 2 have been tested and confirmed as working. 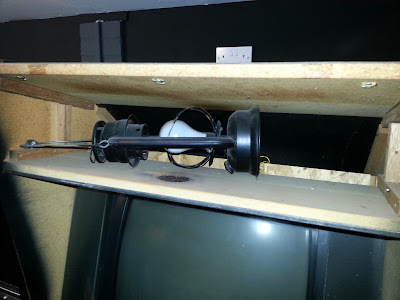 The end result is that Outrun plays in my Power Drift cabinet with Force feedback from the motor shaker in the steering wheel mechanism along with all other game IO. I will update this post with more info when I get the wiring looms remade with connectors that are readily available. If anyone can help with sourcing the JST type connector please get in touch. Let me know if I can assist if you're going to made a set of conversion cables, It should be pretty straight forward now the pin conversion is written done and proved to work. Atari Pole Position. Now what's happened with the road! 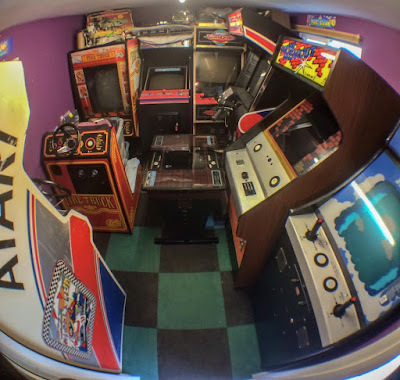 Well after my last PP fix a short while ago everything was looking good and the game played fine until last week when I was shuffling my cabs around in the garage arcade... When I turned the cab on for someone to play (Hi Chris!) The road had again decided to fail. It looked like the track edge (red & white stripe) was covering the grass on the left side of the track, there was also something going on at the right side of the track edge. After a checking some more signals I previously looked at with my logic probe I moved to the area in the schematic labelled 'Roadway Memory and Adders'. From the descriptive name it could certainly be an area I needed to look at. Not long into checking signals, I came across signal 'Σ3' (Sigma 3) which is an output from a 74LS283. There are six of these 'Sigma' signals which are mixed in a 74LS298 with some other signals, the output from that LS298 are the address lines of the graphics ROM which contain the track data. Signal Σ3 was stuck always high in comparison to the other Sigma signals which were pulsing away. I removed the IC put in a new socket and with a new IC inserted we were making progress! In honesty I thought this was going to be the 'fix' for the board, but it was apparent there was now something else wrong as shown below. As you can see above the vertical lines in the track were staggered (i.e. Centre line in track dividing each half) I moved to the schematic section labelled 'Picture Data Memory Address Modifier' and quickly found an LS157 at location 4H with an output that was dead. 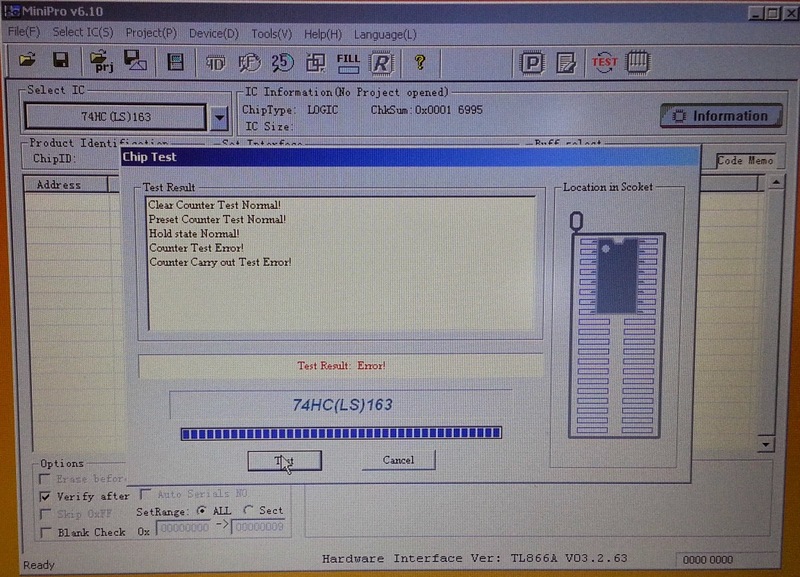 The signal name was 'MUX2' and this is an input into one of the Custom IC's at location 5L. ( If this custom IC is removed the whole track will disappear) I removed the LS157 fitted a new socket and IC and we have a working Pole position again. 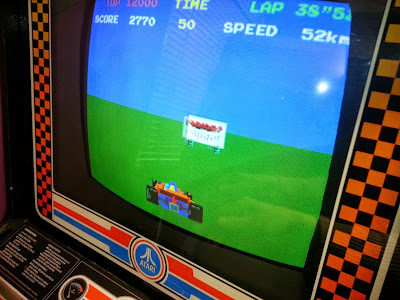 Atari Pole Position. Where's the road gone? So, my Pole Position board had been working perfectly for a year since its last repair, it's had regular play every week and in my eyes it wasn't a scary event turning the cab on, expecting the a bad outcome. Grass tracking instead of GP racing. 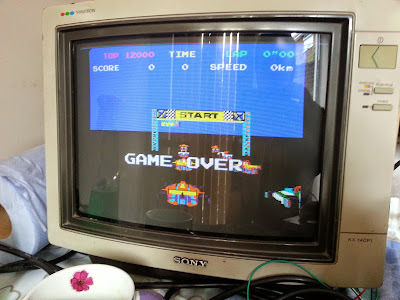 All the scores, timings, signs and other cars were present, the track had gone walkabout... After a couple of re-powers and checking of test mode for RAM & ROM failures, I knew the board had thrown its dummy out of the pram and would need some attention. Test setup for testing.Power and video only at this point. 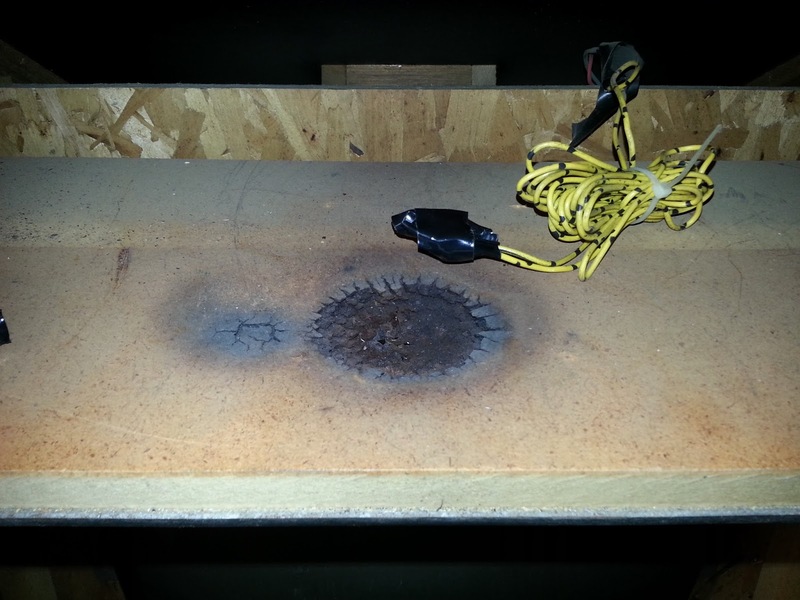 Well after being on the test rig for a very short time, the image deteriorated even more than when it failed in the cab. To me it looked like the 'Green' video signal in the track elements were now missing, the signs and the cars had notably changed colour. 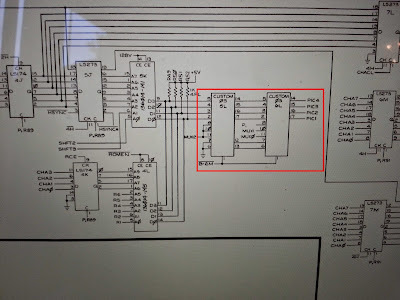 After some extensive google searching for possible faults I came across one post on KLOV arcade forum saying that if the custom IC's 5L or 6L from the Video PCB are removed, you will get the the exact fault that my board originally had. I did have a spare Video board that had never been powered on, my first test was to swap the two custom IC's around, luckily they are socketed so that didn't take more than five minutes to find I still had the same problem with them swapped out, it would have been unlikely all four were bad so I moved on to some 'real' fault finding. With a logic probe, all the input and output signals looked busy pulsing away, signals 'PIC1-4' feed into an 74LS157 Multiplexer at location 8C. With a logic probe I moved through the input signal and everything looked well, moving to the four output signals pin four was stuck low while the other three outputs were pulsing away. I fired up my scope to look that what was coming out of the output pins, and even on the three outputs that were pulsing away, there wasn't much data on the signal and the output on pin four was definitely dead. With the game fully working I did confirm that removing either custom at 5L or 6L will exhibit the same fault my boar had when it failed. Boom! Thanks for reading, more PP repairs to come in the future. I've got a CPU board to look at, it doesn't boot, and I also have a video board that has a graphic fault in the mountains and clouds. I picked up an Enduro Racer board recently, bought as untested, but expected to be faulty. Today I decided to see If I could get the game running. First thing I needed to do was check the Security processor to see if the internal battery was still providing enough voltage to keep the processor alive, I believe if this is flat the game will only ever boot to a black screen. I took the cover of the chip and was presented with a leaking battery, measuring the voltage the battery was totally dead. After searching the web for some info about this issue i came across jammarcade.net Members on there had a whole section of files which enabled you to replace the security processor with a regular CPU, in Enduro's case a 68000 cpu along with updating some of the ROM's. There were only a handful of ROM's on this board that had labels so I decided to go through the whole board and confirm the checksums were correct and put new labels on. All the ROM's checked out ok when comparing them to the MAME sets, It took a while as there are quite a few graphics ROM's. I borrowed a 68000 CPU from a spare Hang-On set that I have and updated the six CPU ROM's that were needed to hopefully make the game work. Once connected up I hit the power switch an low and behold the game fires up and seemed to be fully working!!! 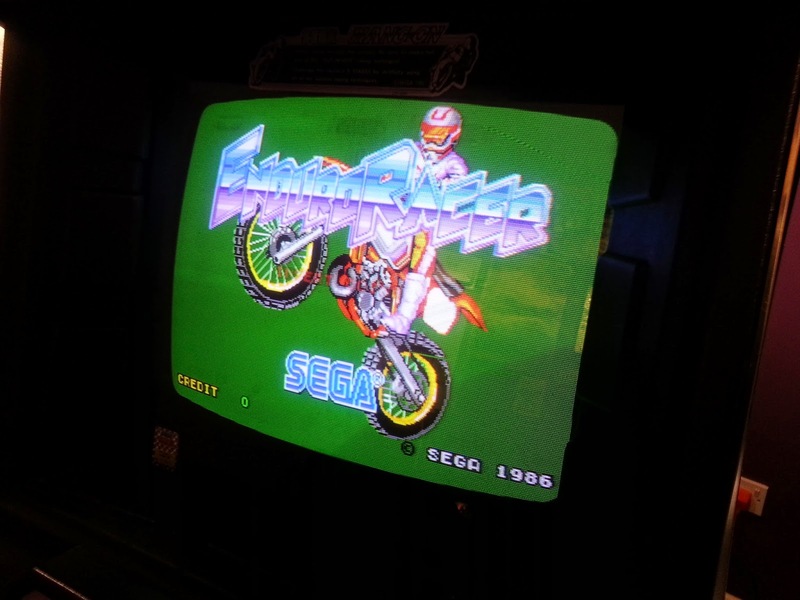 With the game powered on the Attract sound kicked in with motorbike throttle and speech which was a good sign, but without coin input/credit wiring I couldn't hear and music, I confirmed in MAME that no music was played during attract mode and then looked at the dip switch setting, there was a 'Free play' mode I changed the setting and when the game was powered back on the background music came blasting out. 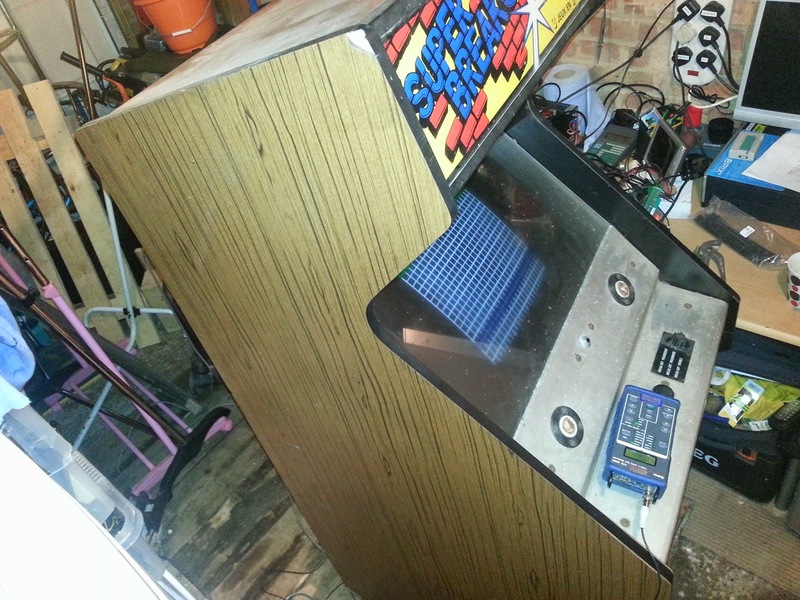 Well a few weeks back I picked up a new cab, a 1978 European (French Built) Atari Super Breakout. 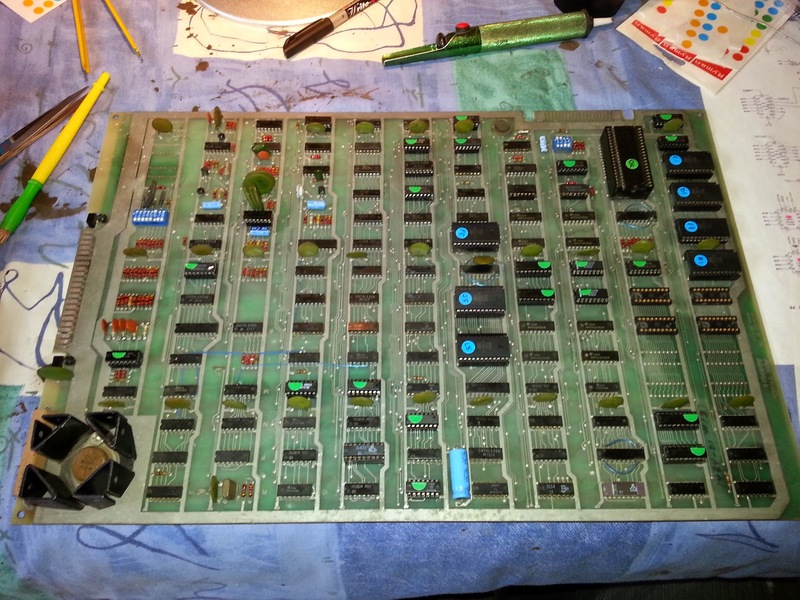 Bought in an unknown condition, it turned out the only faults were with the game board (No surprise there !) and the LED on the Serve button being blown. The photo below shows the cab with my test generator plugged in in need of a good clean. 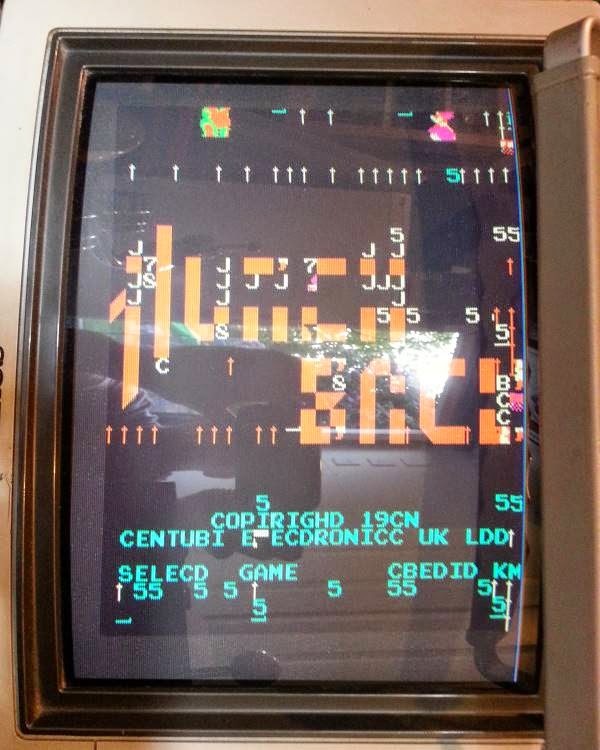 After confirming all the cab voltages were correct & present, I plugged the game board in to be greeted with a black screen and some very faint horizontal lines running across the screen. To get this running in a test rig I re-used my FireTruck/SuperBug adapter as the pin outs for these games are similar, well the Power and Ground signals to make the logic work are on the same pins. I added a few new links on the adaptor to supply my monitor with Composite along with a few switches for Coin-up, Serve and Test. Now on my work bench, (AKA the Dining room table) the board gave the same symptoms as in my cab. First I checked using my logic probe to see what the CPU (6502) was up to. 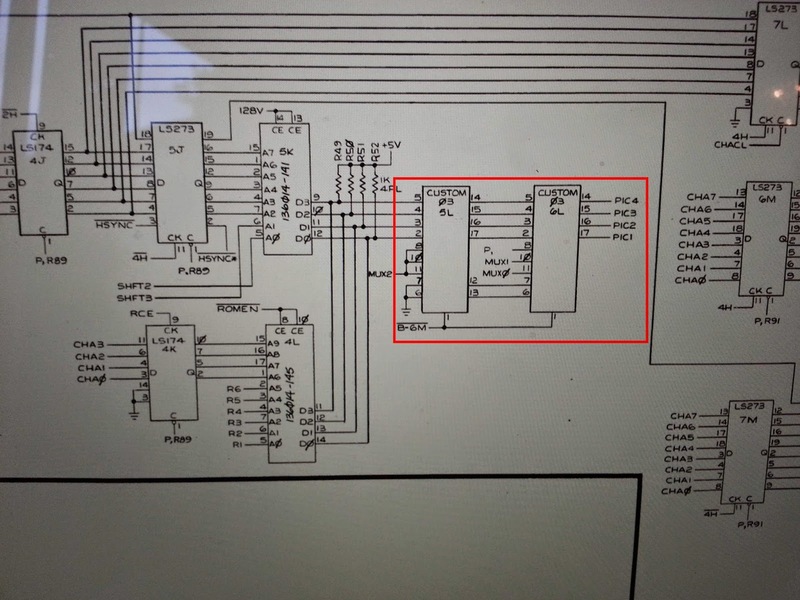 Pin 40 of the CPU is the reset pin, this was constantly pulsing high and low when it should be constantly high after an initial low at power on, from this we know that the CPU is not running the game code from the ROMS. Next to check was the clock circuit, Pin 37 of the CPU is the clock input, this pin should have a nice clock signal on it but there was only a low signal and no pulse. I then went right back to the start of clock circuit and checked the 12Mhz clock and the circuit where the frequency of this is divided down to the Horizontal & Vertical timings that keep the board running in time. All the H&V clock signal checked out OK which the took me back to looking closer to the CPU clock input. There are three IC's directly involved in making the clock input for the CPU run. As it turned out all three were faulty. A74LS20 @ A8 had a dead output, this fed into a 74LS174 which had a bad output on pin 12, this connected to a 74LS32 which should provide the CPU clock signal, this output was stuck high with no data pulsing. Once all three were replaced and confirmed as faulty, the clock input was looking good, clock outputs 1&2 also came to life now, address bus and data bus lines were active but something was telling me the pulsing I was seeing was not right compared to what I have been getting used to recently while working on board repairs. The game was still resetting. 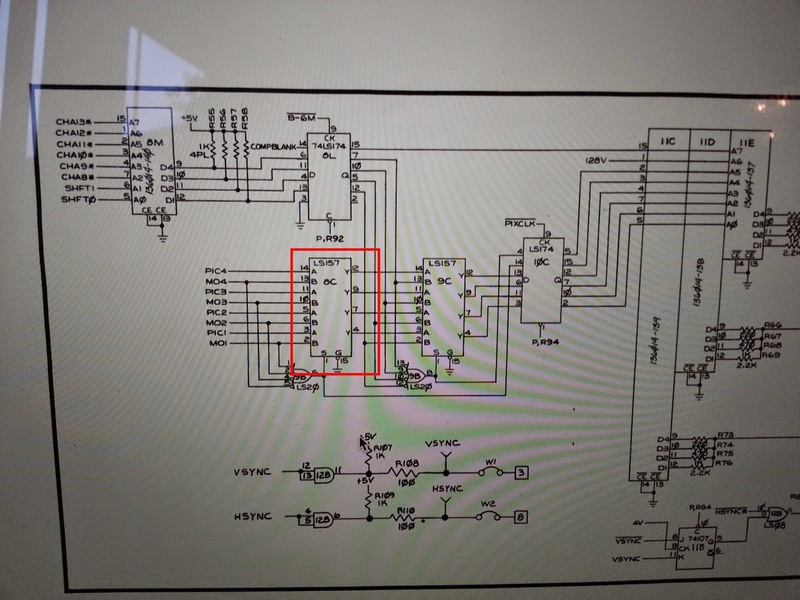 Following the path of the Address bus lines there was an IC @ F2 labelled as a 3901 on the Atari schematics, the outputs of this device are the PROM select lines. All 6 used and the for unused output were dead, Not high, not low but completely dead. 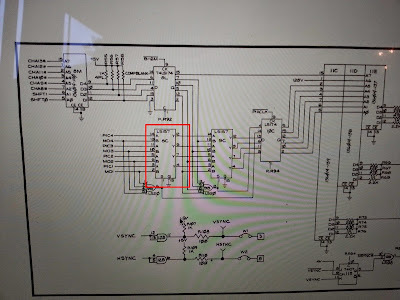 Researching what this IC was and where I could source a spare I found very little info other that a post in a pinball newsgroup from 2007. the 3901 was a '1 of 10' decoder and seemed to now be unavailable anywhere, to me this looked like a similar decoder, the 74LS42 which is used in other Atari games I've worked on, the only difference seemed to be the pin out, so I had to make an adapter to convert the 74LS42 pin out to fit how the 3901 was wired on the Super Breakout PCB. I decided to know up a IC socket to socket adapter with wiring to convert the pin out. The finished item is below, it's not pretty and at the time I wasn't quite sure if it would work, but it had to be better than an IC with no working outputs. Upon power up we now had some garbage on screen, the CPU was still resetting but I was making progress :) All the other important signals which should make the game run were present but again the way the pulsing looked on my probe made sure something else was still pretty sick on the board. I next decided to socket and replace the eight 2102 RAMs. I have no way to test these so for now putting new replacements in would hopefully help me get the board working, I'd then be able to test them once the board was working. After swapping these there was no difference to the above screen. 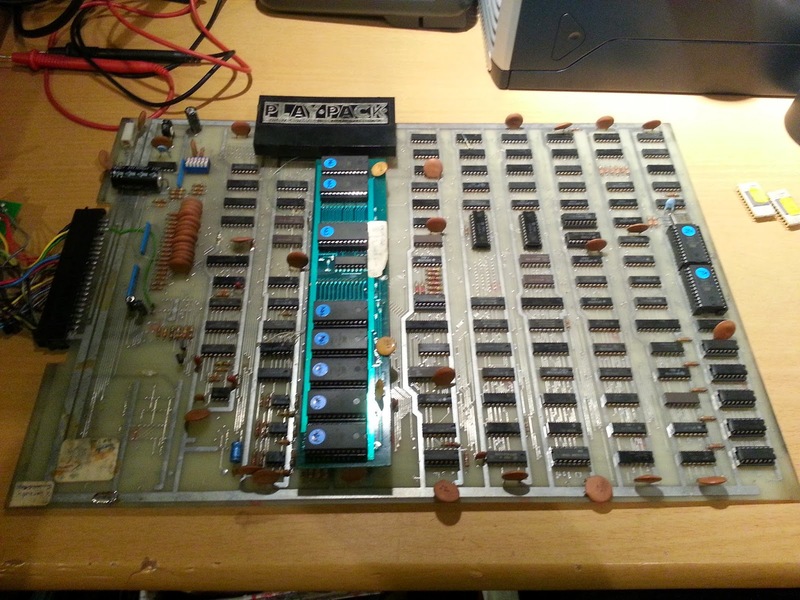 I decided to try swapping the CPU with a known worker, my Missile Command PCB now comes to the rescue... After swapping the 6502 over the game comes to life! Watching Attract mode shows the blocks disappearing with no sign the balls. Game now running with invisible balls! 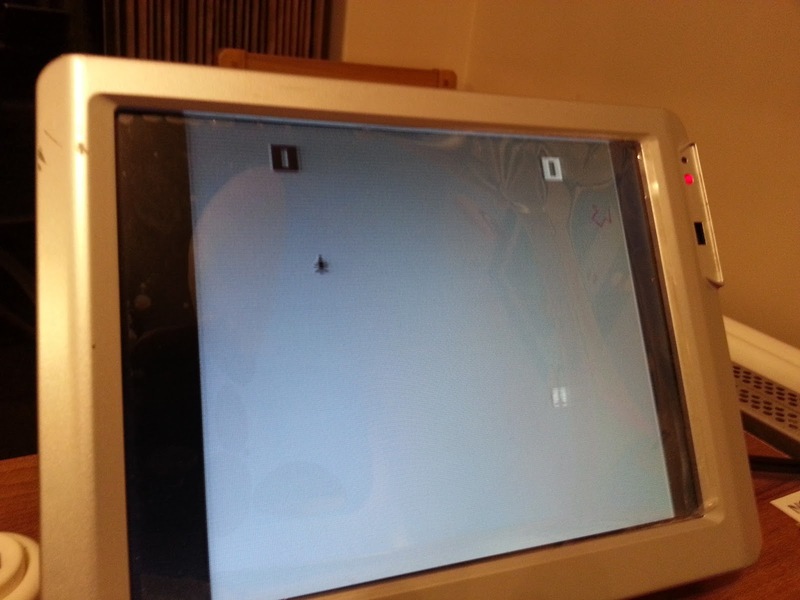 The game wouldn't start or go into test mode and as mentioned there were no balls in attract mode. The Coin, Start and Test inputs are pass through a 74LS153 @ M8, the output pins from this IC were both stuck high, removing and testing it confirmed it was faulty. After swapping the 153 the game would start and would enter test mode. Test mode gave no errors so things were looking good other than the missing balls. The three 'balls' video signals are derived from a bank of six 74LS163's, piggy backing two of the six with a known good device made two balls return. These two were removed and replaced, the third ball couldn't be found by piggy backing on another '163 but I used some guesswork and removed the IC I thought was the problem, It did turn out to be faulty and once replaced the game looked like it was fully working. 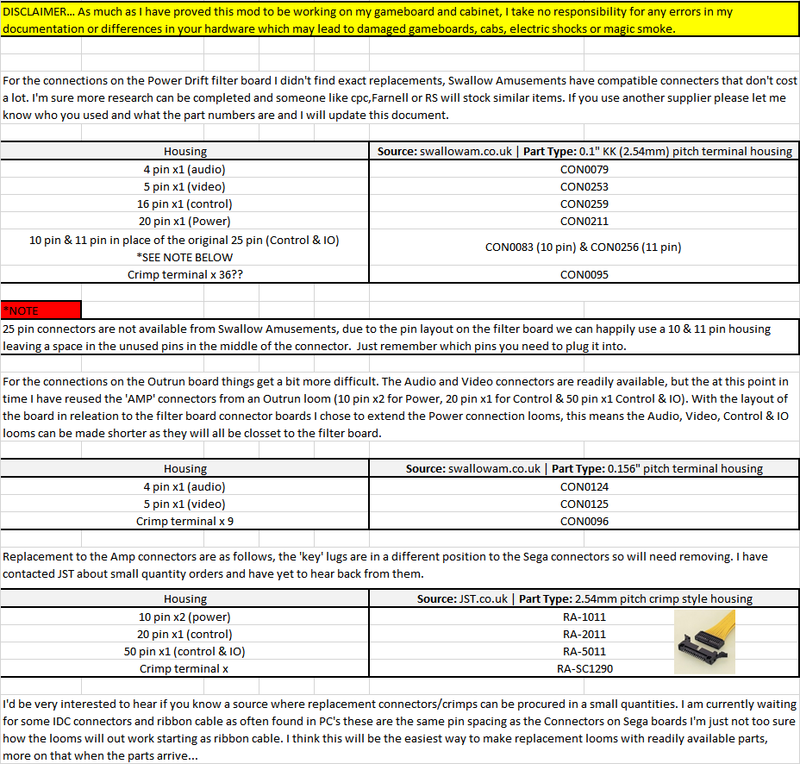 The three '163's (Locations R6, P6 & N6) were tested and confirmed as faulty as shown below. Time to put the board back in the cab an check the controls and sounds. All sound and controls worked great. 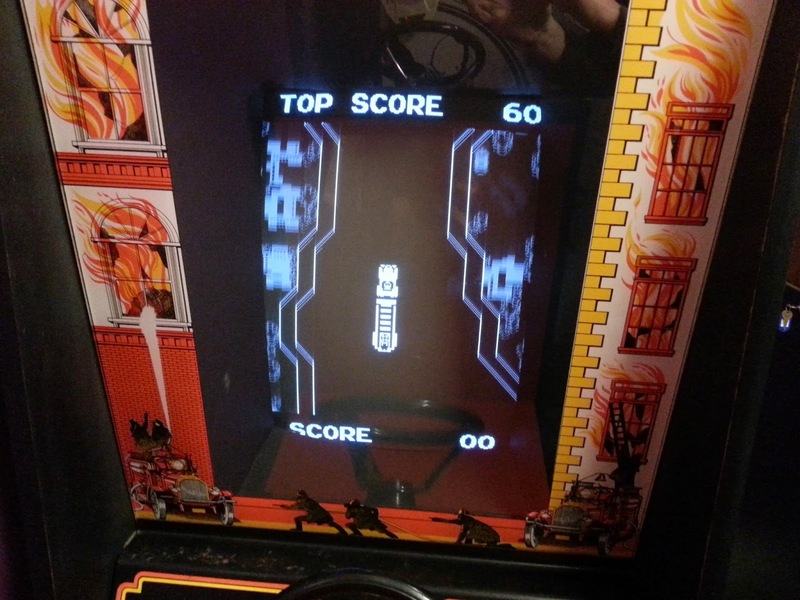 Super Breakout Back in the cab & fully working. Total parts replaced for this repair. 1x 9301 counter F2 (Replaced with 74LS42) ROM Selector. All outputs dead. 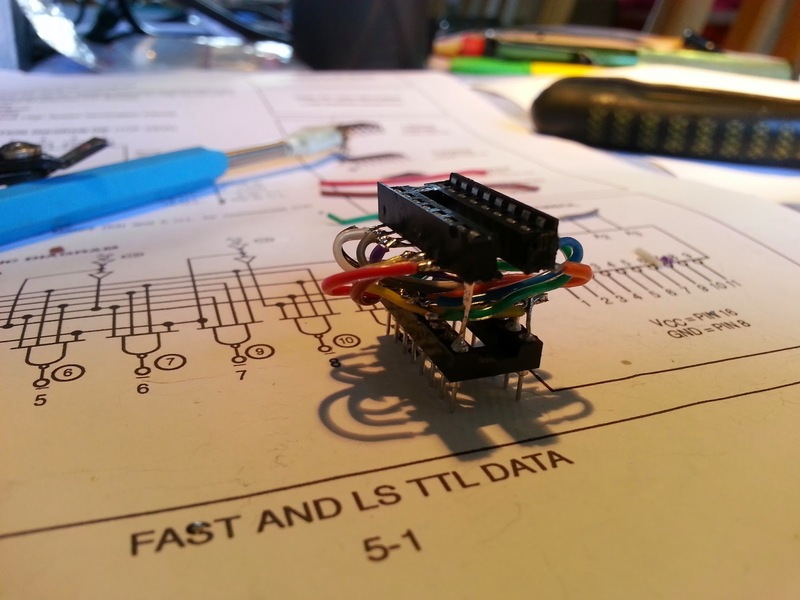 1x 74LS153 M8 Input circuit, Test mode fault. 3x 74LS163 R6, P6, N6 Ball video circuit. Fire Truck PCB. Mega repair! So I offered to fix a Fire Truck Board and boy it’s been one hell of a repair. Well for me anyway! The board was genuinely untested for a long period of time and for all I knew it could have worked. Dream on! Photo below showing the board being powered up in my cab. The game is not running but at least there’s a video output, that's a starting point. So not wanting to be fixing this board hanging out the back of my cab I needed to make some sort of test loom. Test rig running Super Bug. They have a similar pinout. 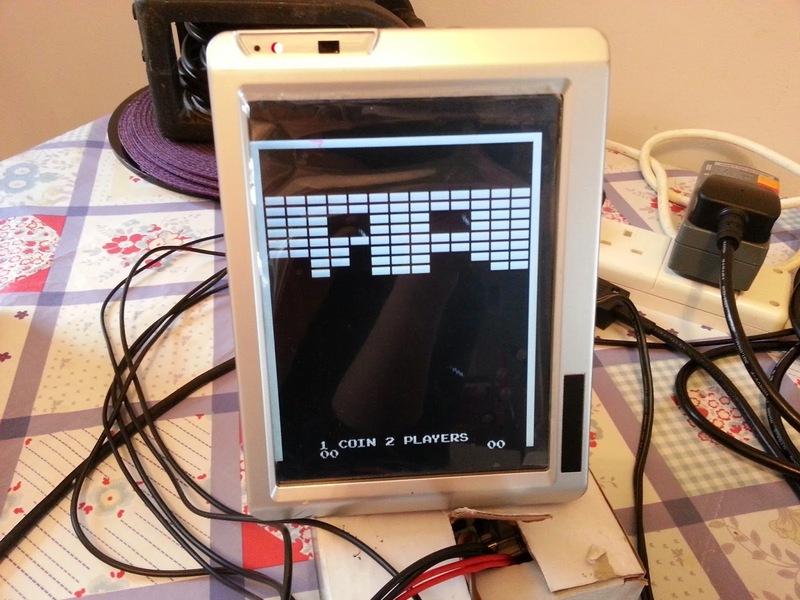 The game runs from 10V unregulated coming straight from the power brick, this feeds into an LM323 on the game PCB which generates the 5V DC which powers all the game logic. I used an open frame PSU which was rated at 12V 3A which was in spec. for the LM323 and shoved it into a cardboard box to give some safety over having 240V cables exposed! I also then added a phono lead on the adapter from the video and audio pin-outs. The audio is not amplified on the game board so it was fine to feed this straight into my test monitor. I’m going to simplify the written down fixes as I spent a fair amount of time going round in circles whilst ‘learning’ about the roles of the CPU/RAM/ROM and their associated circuitry. 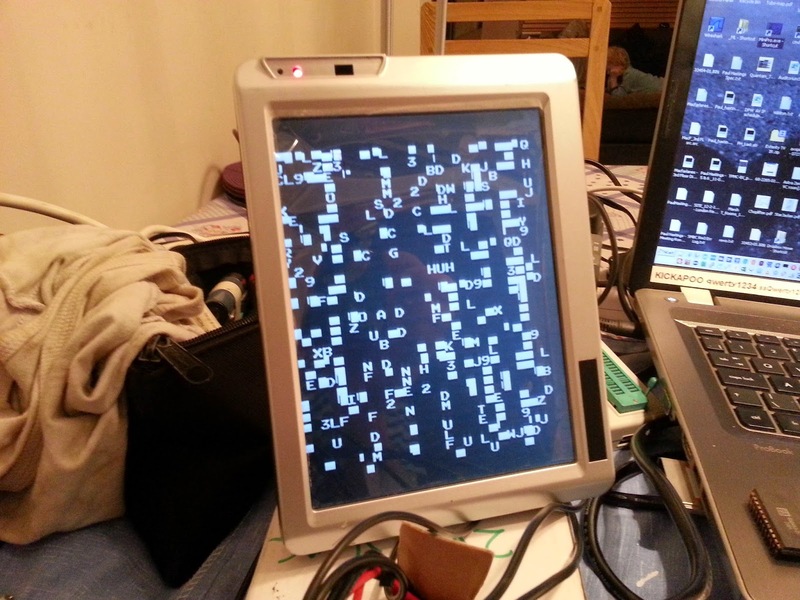 The board is quite good in that is doesn't need the CPU to be running correctly to display certain graphics, albeit garbled on screen. A visual inspection showed a few scuffs around the board and a few possible suspect broken traces, after using my meter in continuity mode all suspect areas belled out ok. Next up were the ROM’s they were the only socketed IC’s on the board after removing then every IC had broken tarnished pins, I put the effort in and de-soldered legs back on, about 20 legs across 8 ROMs! I did get most of these to verify against my own ROMs but I wasn't happy that they would provide lasting reliability, some of the legs were flexing and most were badly tarnished. I replaced all the ROMs with 28c16 Flash ROMs they’re direct 2716 replacements and can be reprogrammed without the need for erasing under UV. So I knew the ROMs would be good but one of the ROM sockets was very badly installed… It clearly hadn't been seated correctly when originally manufactured. The pins at the raised side didn't even make it completely through to the solder side of the board so I had to swap this out. Now then, I've put the ‘fixes’ in the order which I probably should have worked on them rather than the order that I did fix them in. All suspect IC’s were removed and tested in my programmer, I removed a few device in error but I’d say 95% of my theory/hunches on faulty IC’s were correct. Board voltages were sitting nicely at 5Vdc, the 12MHz clock looked good and seemed to propagate throughout the board, moving onto the CPU, pin 40 the reset line in normal running mode should be high but it was toggling high/low constantly so the game was resetting and not actually running properly. There are two 74ls367 address line buffers A1 & B1 both of these had pin 9 stuck low. Confirmed as faulty. The 'Watchdog reset' signal comes from LS42 counter at D6. The inputs to this all look good, IC removed and confirmed faulty. Replaced IC. The 'Watchdog reset; signal is put through an LS08 AND gate, the other input to this gate is the 'Test' signal, the output is stuck high in effect never clearing the shift register. LS08 at B5 confirmed as faulty. 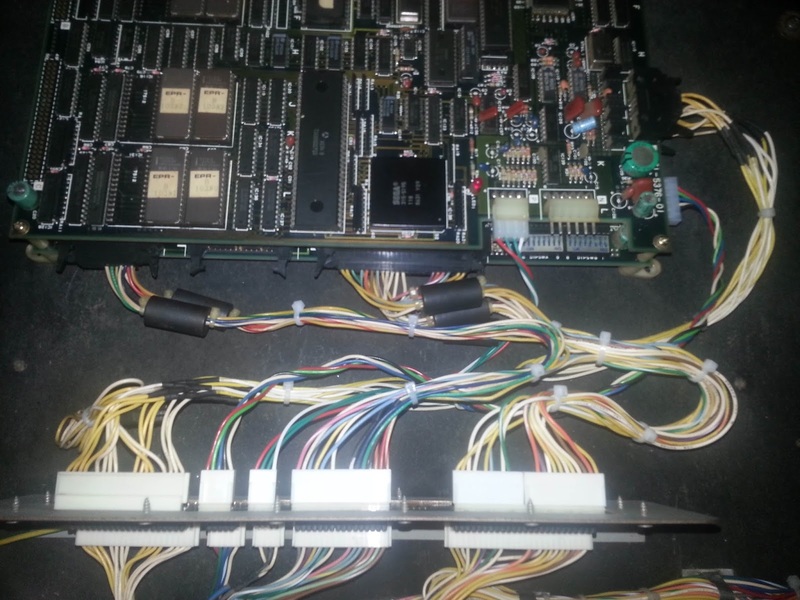 74LS42 at H2 is a decoder that drives the ROM select lines along with RAM select lines. 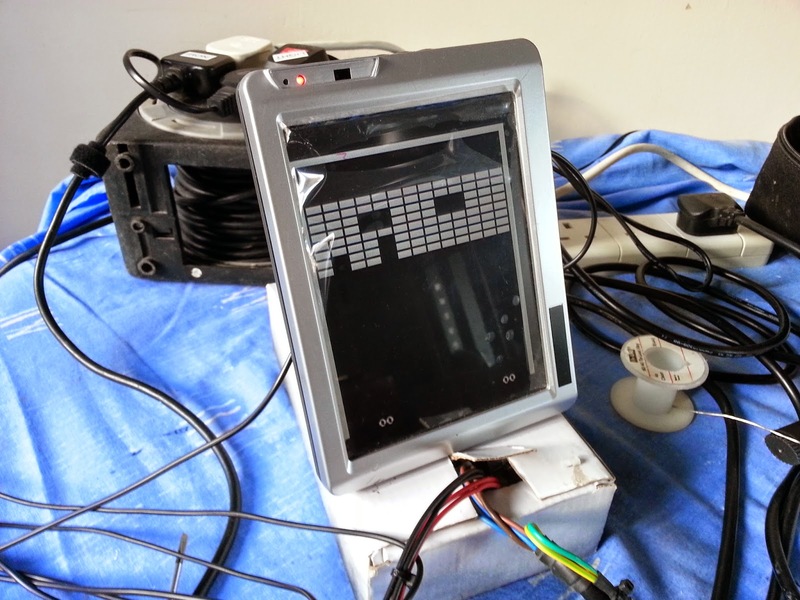 It's noted the there is no activity on ROM1, ROM0 and the PRAM signal, if these signals are not being driven the program code can’t be running correctly. IC removed and confirmed as faulty. Board still resetting. Goes for a beer! Next up was a bad LS02 at location N5, this is the Output Disable line for the RAM, I didn't log what was wrong and cant remember but it tested faulty and was replaced. After this there wasn’t really much else that I could find that looked wrong signal wise, certainly with a logic probe.… Hunch time! What about the RAM? 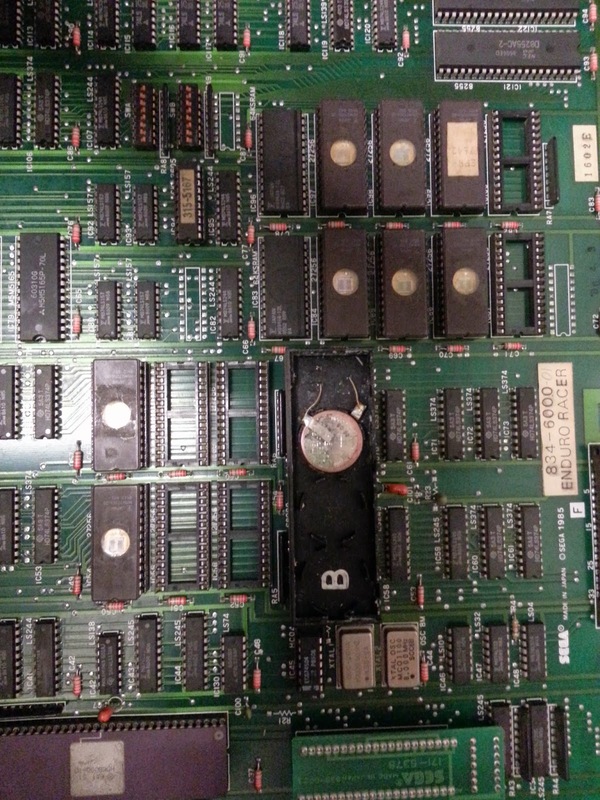 Now this plays apart in the CPU/ROM/RAM chain, there are four RAMs on the board all 2111’s and there soldered, I decided to remove all of them and test them in my working board which has one RAM socketed. All RAMs are confirmed as faulty. H4, J4, N2, P2 all faulty. All socketed and replaced, IC”s procured from Twistywristarcade.com in the USA. Surely there couldn't be much else stopping this board from running, turns out an LS367 at C3 had a bad output, this buffered one of the clock outputs from the CPU which in turn controlled the read/write signals to the RAM. IC confirmed as faulty replaced. The Alpha numerics seem to work showing the current and best scores and the front of the Fire Truck seems to be heading down the road but its graphics are slightly corrupted, also the rear truck is missing. There was constant audio tone coming form the audio output, this is more annoying than anything else so I take a look at this next. All the individual sounds are generated from separate parts of circuitry (See Equites Asteroids Fix log for a similar problem) I isolated these one at a time and it turned out that the 'Extended play' sound is stuck on, IC B6 a 74LS74 flip flop had a stuck low output. IC removed and confirmed as faulty. Replacing this stops the constant audio tone. Moving on to the Cab of the Fire truck, the data for the truck comes out of a Prom at location P7, these signals are fed into an LS153, the output of this 'is' the cab video signal that gets summed before finding its way off the board to the monitor. Pin 1 (Enable) of the 153 was stuck high. This signal is fed from a 74ls74 flip flop (M8). Pin 5 the Q output was stuck hi, IC remove and tested. Confirmed as faulty. Cab video comes looking good. The 'Tail' of the cab was completely missing on the display, data was coming out of the Tail ROMs at J5 & L5 but the next IC in the chain (74LS273) at L6 didn't really have much activity on its outputs, the clock input for this device (pin 11) was dead, I traced this back to a faulty LS86 at location N8, once replaced 'Tail' video returned. Next up, the background playfield area decided it would fail, It did look normal at one point but during testing the background went all blocky with no real definition to the houses, cars & fire hydrants etc. All the signal coming from the RAM/ROM looked OK, the *PFLD signal is fed into a 74LS02 NOR gate, the other signals on the input of the NOR gate are mixed clock signals, I decided to piggy back this and the fault went away, so I swapped it (A5) out and we had definition in the backgrounds again. Now we had definition in the background, the vertical scrolling was not smooth and the lines of the video didn't seem to be getting displayed in the correct order, I traced this back to a faulty 74LS157 at J3. 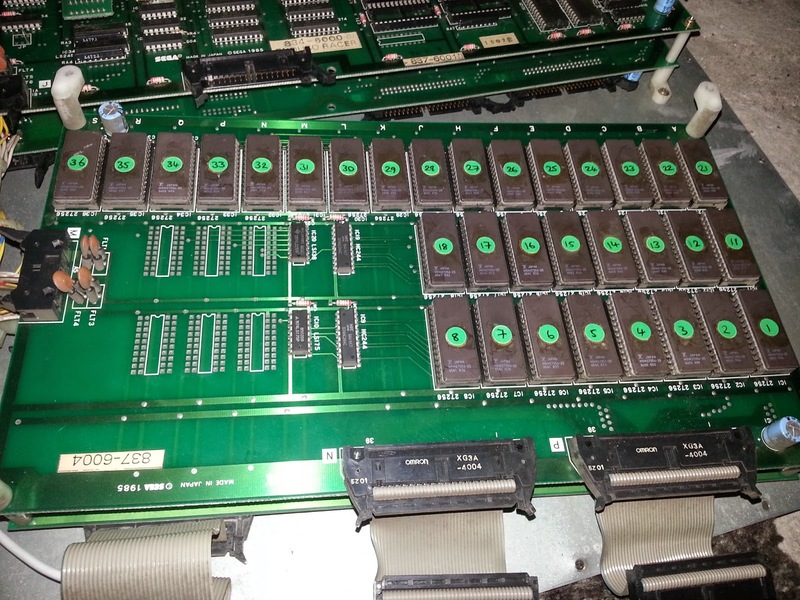 This IC provided the playfield RAM with position data, once swapped out the playfield was once again scrolling smoothly. 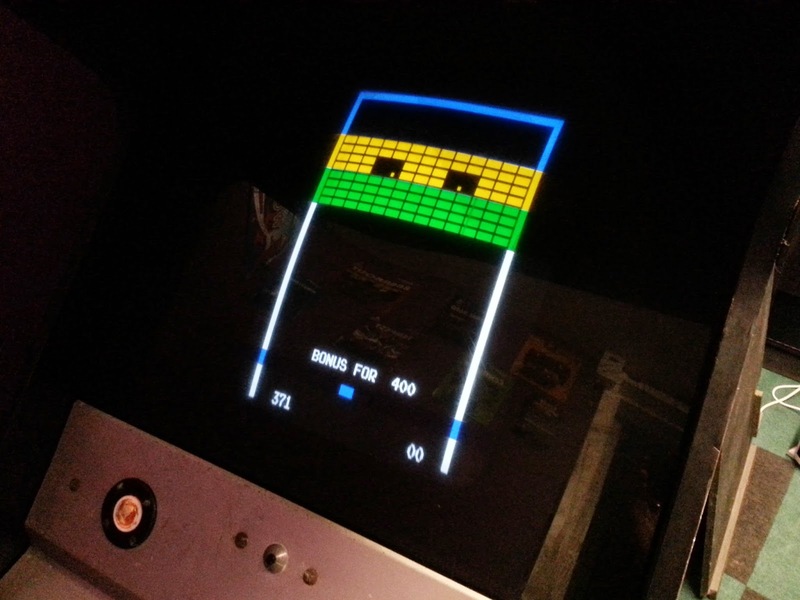 So from the test rig it looked like the game could now be played in the cab, so off I go with fingers crossed and plug it into a real cab. Upon power up, all the player/track select LEDs are flashing and it seems all the player/track select input buttons worked which was good. I started a game and found there was no acceleration from the Gas pedal because the truck never starts moving the steering couldn't be tested, when the game was started I could hear the engine noise and a few other sounds, the Horn button on the front control panel worked but the Bell button didn't work. The LS251 at location H10 was the main culprit for the lack of throttle, theres really no other components involved, no signals using a logic probe looked bad so I removed the IC and swapped it for a known good one. 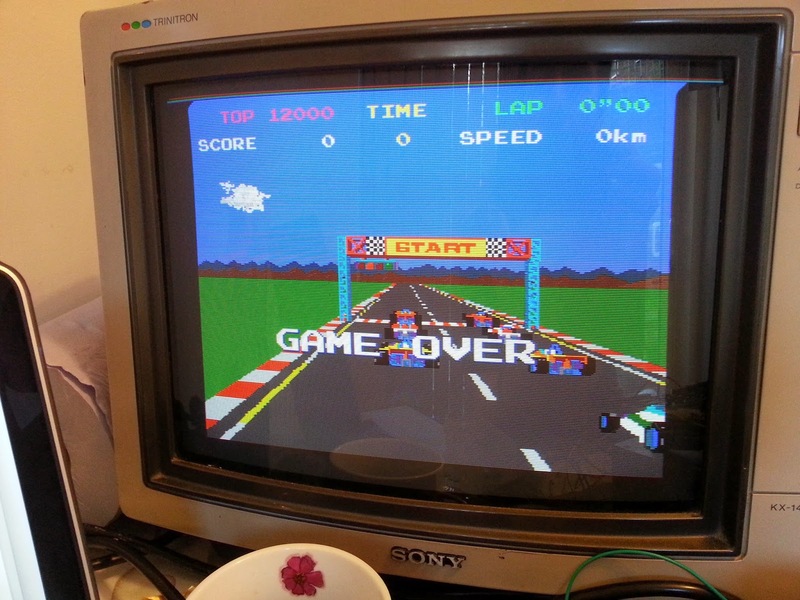 The game now had throttle, automatically for rear one player mode and manually from the gas pedal when selected from the front control panel. Once we had some acceleration I tried the steering in both game modes and found the next fault! From the rear steering wheel the 'tail' of the cab would turn erratically in one direction, this would also cause the 'cab' graphic to distort when it rotated. From the front steering wheel there was no steering at all. I traced the steering fault to a 74LS14 at L1. Inverters 1, 3 & 6 were faulty, effectively three of the four steering signals were not working correctly. 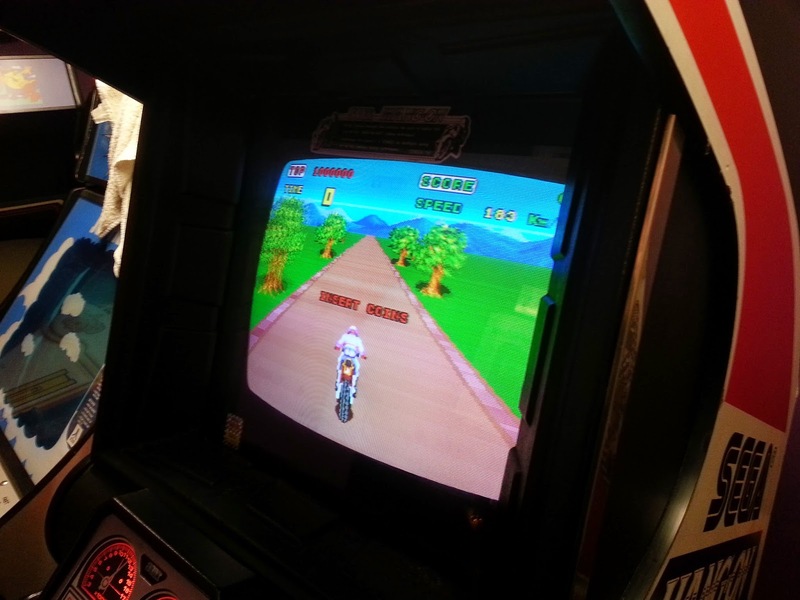 Once swapped out the game had fully functions steering from the front and rear wheel. At this point I confirmed all game controls and sounds worked correctly. Now the steering was working there was a notable fault with the 'Cab' graphic when being rotated from the steering. When pointing straight up the road everything looked ok, but when turning the image looked corrupt. The fault was traced to a 74LS86 at location R6. This IC sends signals to and LS157 which then addresses the Prom which telling it which 'Cab' video data to display depending on the wheel rotation, the signal on pin 8 (V4) didn't pulse in a similar fashion to the other outputs, I remove the IC and sure enough XOR gate three was confirmed as faulty. Once replaced the game was play tested in all game modes, and now works flawlessly. A final fix for the board before handing it back to its owner will be to change over the two different dip switch banks. Both of these are not working correctly, the original ones seem to be spring loaded and most of the time even when they were clicked into their correct position the dip switch state wouldn't change unless you a applied extra pressure to the switch, this was mainly noticed by the game language changing by itself on regular occasions. 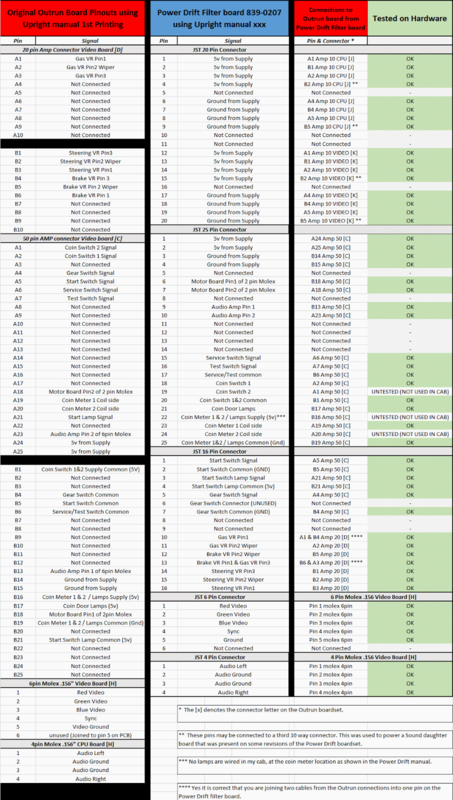 To round this repair off, here's the complete list of faulty IC's replaced to get the game working again. Green dots indicate replaced IC's that fixed faults. Blue dots are the CPU and some of the Graphics ROMS. Subelectro Hunch Back. 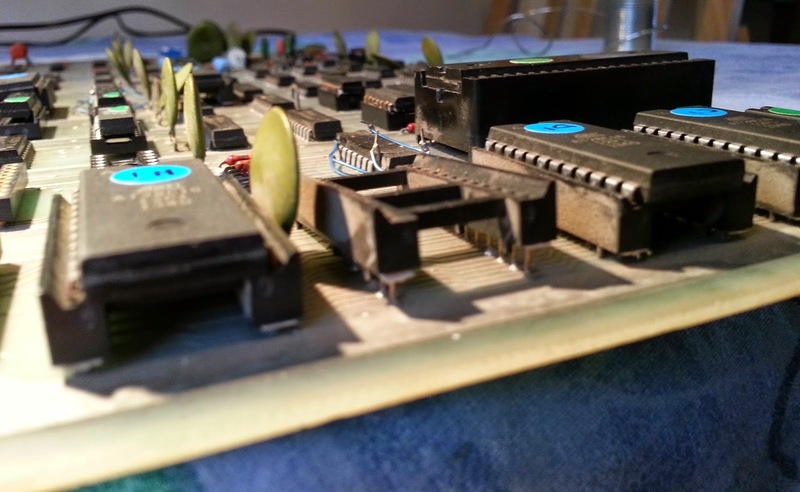 PCB Repair. After nearly a year of being in s pile of boards that needs fixing, I spent some time tonight fixing my Subelectro Hunch Back board. With reference to this thread on the UKVAC forum from when I originally purchased a Subelectro cab with this board in. 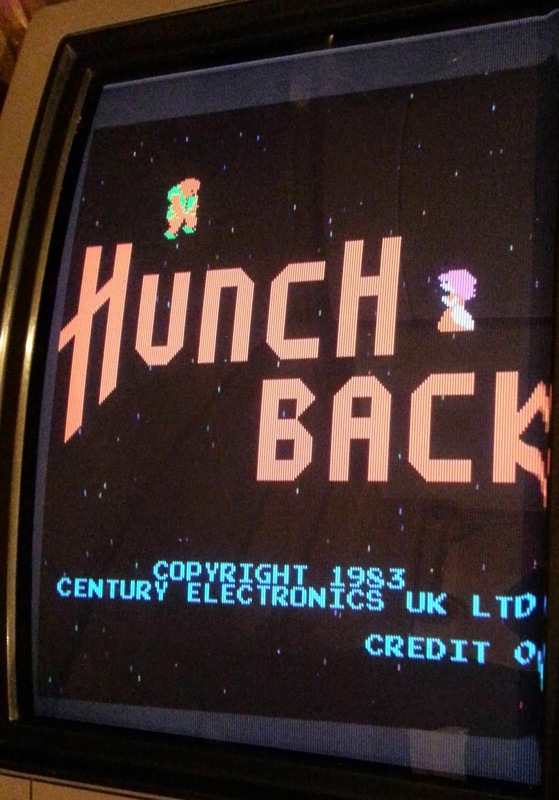 I had this board fixed by a repairer when I first got the cab, but on its return it lasted not more than a few hours before having jumpy graphics and eventually not booting correctly with a black screen displaying 'CREDIT 0' and making a constant audio tone. Fast forward to having a bit more experience and a few tools, my first port of call was to verify the ROM'S. 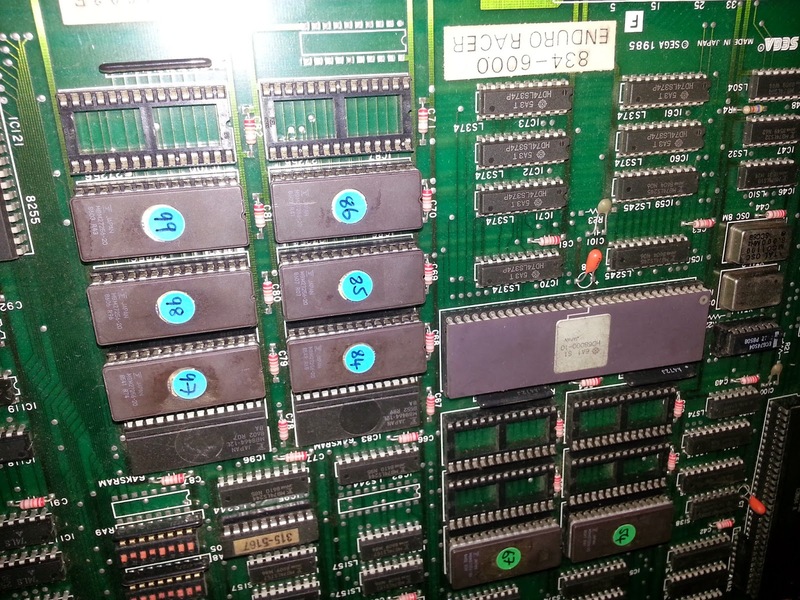 The board has eight CPU program ROM's and two graphics ROM's. Of those, three of the eight CPU ROM's claimed to be blank or wouldn't verify against the on-line Romident tool. Both of the CPU ROM's also didn't verify correctly, I re-burnt a complete set of new ROM's tonight and upon power up the game booted and played correctly. 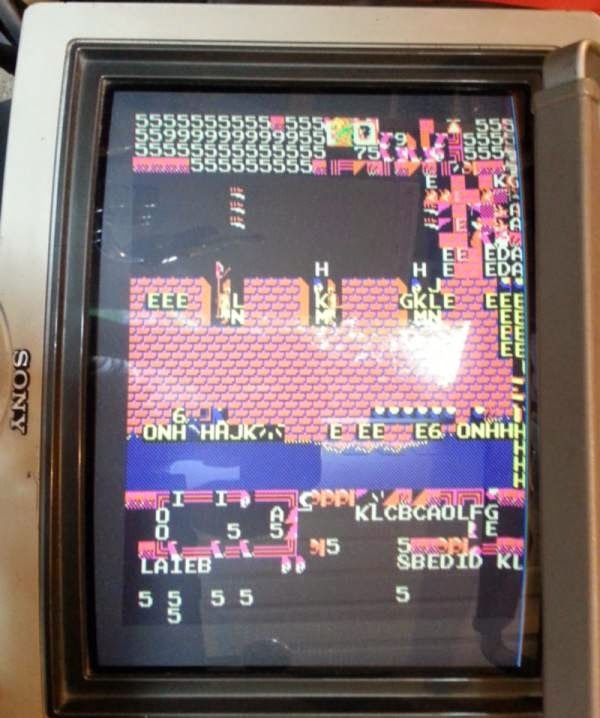 My test monitor struggled a bit with the video sync on the far edge of the image, but it will display fine on an arcade monitor. Makes a change having an easy fix like this! 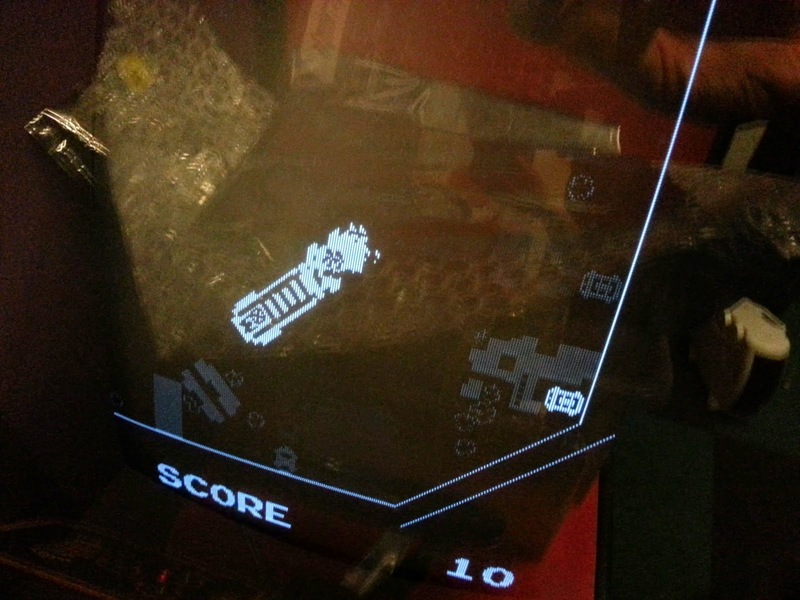 Images below of the working game. 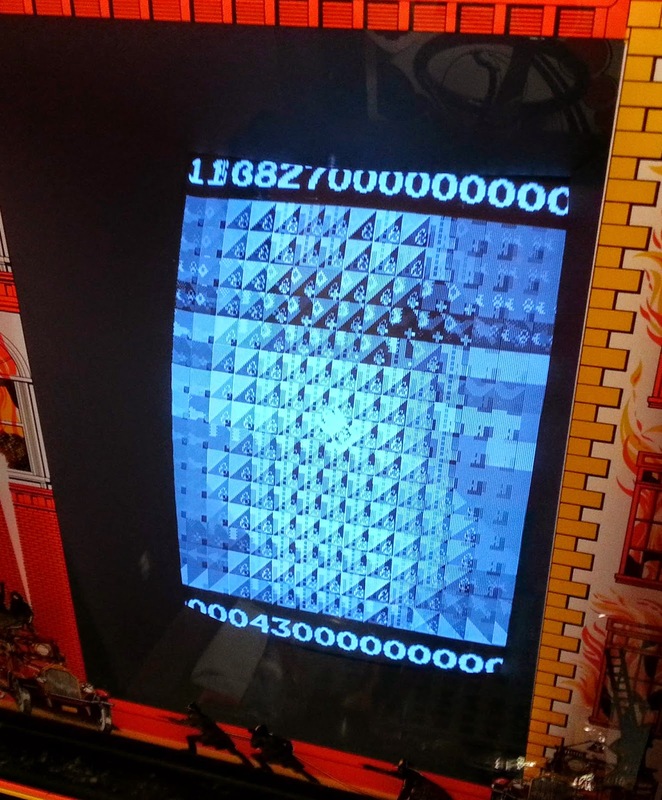 The Subelectro Hunch Back board, running on Galaxian hardware. 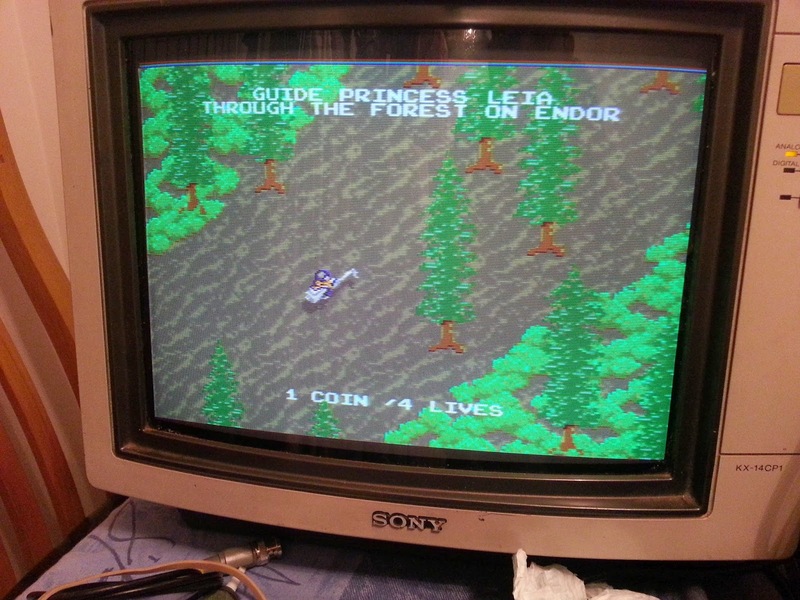 Atari Return Of The Jedi. PCB Repair. 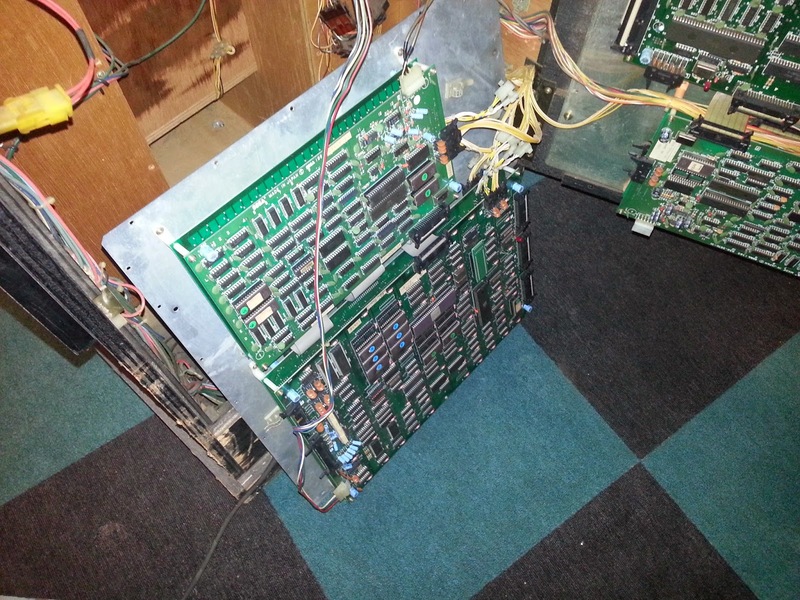 I recently acquired an Atari ROTJ PCB in an untested/unknown state. First up I had to make an adapter so It could be wired into my JAMMA test rig. Upon 1st power up the game loaded and played but had some colour issues with the display and also all the foreground sprites had horizontal line missing from the graphics. All text and other graphics seemed to display correctly. 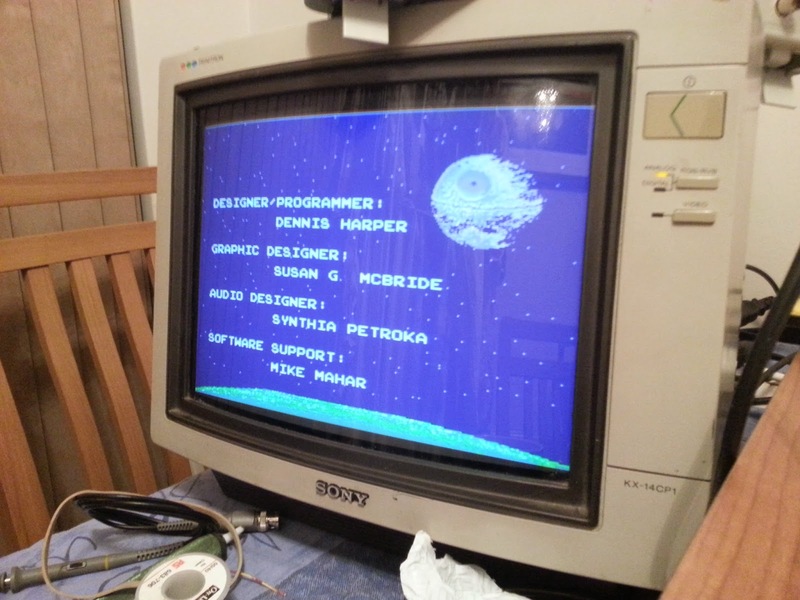 The screen below also showed some colour error (Green hue over complete screen) along with missing lines in the Deathstar graphics. After spending a fair amount of time using my logic probe to find a faulty IC I didn't really make any headway into the issue. I then decided to put the game into test mode to see if the diagnostics would point me in the direction of the fault. Well the game wouldn't go into test mode and seemed to stick on a Magenta/Pink colour screen when switched into test mode. Not a great help I thought... 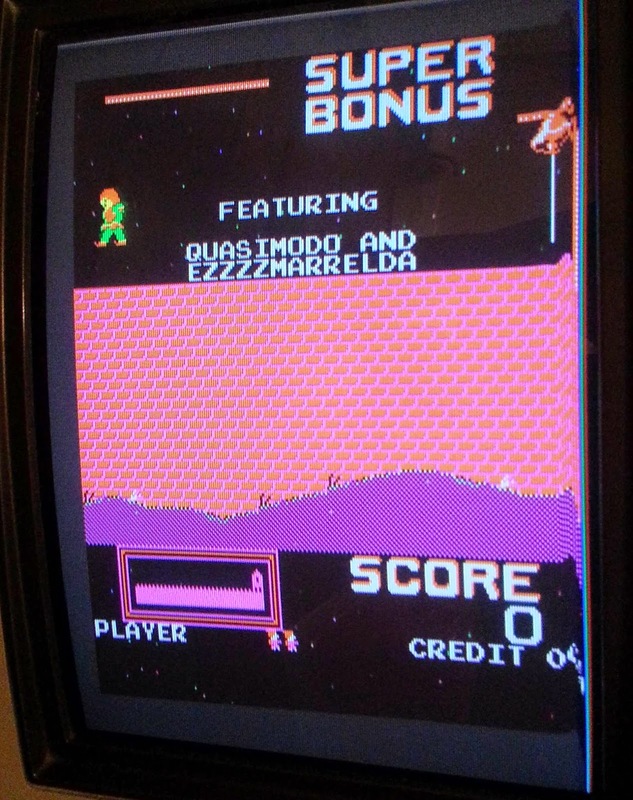 I decided to read the Manual for the game and sure enough a Magenta screen when set to test mode indicated a fault in the Colour RAM section of circuitry. As it turned out a RAM at location 12R was faulty. Initially I piggyback a new RAM on top of this one and the colours came back but it still wouldn't flip into test mode. So I swapped the IC anyway and on power up the colours now looked good and the board went into test mode. No green Hue on the screen below now, but the missing line now quite visible. Pins on a 74LS163 in the Horizontal line buffer section had been bent over and looked like they were tightly presses into a track from another pin. I used my multimeter in continuity mode and confirmed that some pine were shorted together. I uses a scalpel to lift the pins away from the track which they seemed to have been squashed into. Upon powering up the sprite issue had gone and the game was fully working. 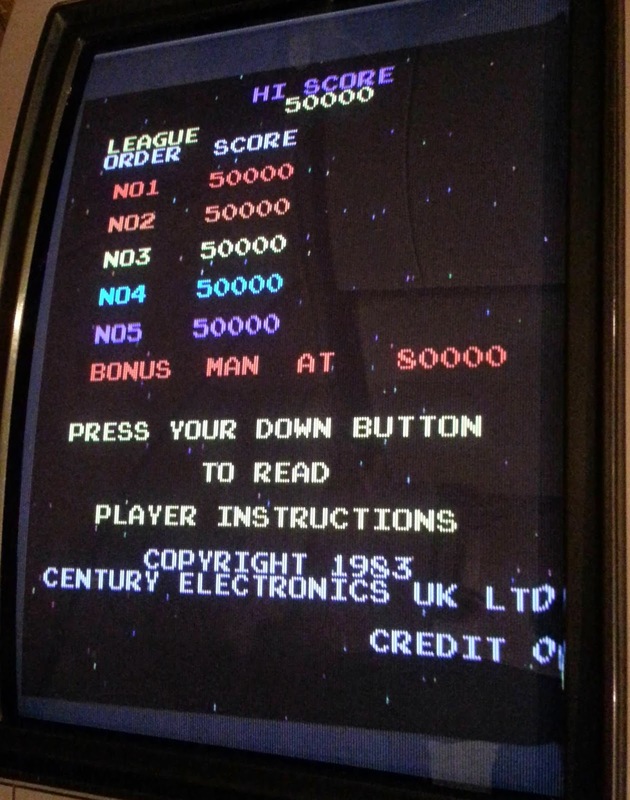 The pins that were shorting were pins 1 (Reset/Clear), 2 (Clock), 3 (Input A) & 4 (Input B). Note to self to save time in the future, begin board repairs with a good visual inspection especially if the board has been stored for years with an unknown history, anyway the board is work and I'm well chuffed. Fully working Game images below. I forgot to show an image of the offending pins which caused the sprite issue. It was in device location 5N the board. See image below, I think something has scraped over this IC in the past or been squashed up against something whilst in storage.